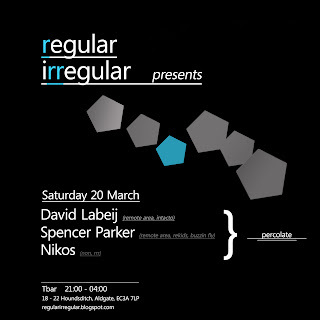 regularirregular is embarking again on a regular bimonthly residency with copious amounts of irregular extemporizations! This project is dedicated to hosting undaunted, excessively skilled artists who have skillfully crafted their own trail. Uncompromising house and techno celebrations will take place with quality music and sure-fire performers being of paramount importance to us. We invite you to join our night and become part of our acoustic exploration of Tbar’s glistening underground.